Through the various ages the notion pentagram has had several meanings. The Pythagorean called it the “Pentalpha”, the Celtic priests “Druids’ foot”. Other designations are “Seal of King Salomon” and “Gobelin cross” during the Middle Ages. 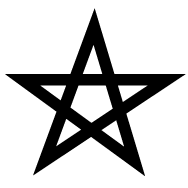 The main symbolic value of the pentagram is that of the ‘calamity averting sign’. The devil and other evil spirits are seriously hindered in their activities by the pentagram. At least, that is what Goethe claims in his “Faust”, as Mephistopheles cannot cross the threshold while seeing a pentagram on a door. For the same reason gravestones are frequently provided with a pentagram.